Tree induction methods and linear models are popular techniques for supervised learning tasks, both for the prediction of nominal classes and numeric values. For predicting numeric quantities, there has been work on combining these two schemes into ‘model trees’, i.e. trees that contain linear regression functions at the leaves. In this paper, we present an algorithm that adapts this idea for classification problems, using logistic regression instead of linear regression. We use a stagewise fitting process to construct the logistic regression models that can select relevant attributes in the data in a natural way, and show how this approach can be used to build the logistic regression models at the leaves by incrementally refining those constructed at higher levels in the tree. We compare the performance of our algorithm to several other state-of-the-art learning schemes on 36 benchmark UCI datasets, and show that it produces accurate and compact classifiers. 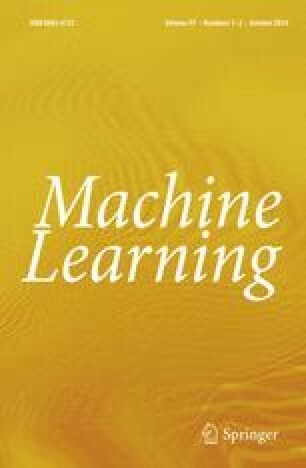 This is an extended version of a paper that appeared in the Proceedings of the 14th European Conference on Machine Learning (Landwehr et al., 2003).